In every major tour, more and more pros are using the Bont a-one shoe. Made in Australia, this handmade road shoe features a bathtub-style, 100% unidirectional carbon fiber sole that wraps around your foot. This is for the a3. First of all: I see no reason to buy a higher end shoe than this ever. This is by far the stiffest sole I have ever seen on a shoe. I've worn shimano, sidi, adidas/mavic, and Giro top of the line shoes and these blow them all out of the water. You would expect a weight penalty for this but the a3's tip my scale at 220grams for a size 40, every other pair of shoes I've owned has been heavier. The heat molding process can be done multiple times, I've done it twice, and they fit phenomenally. My only complaint is that the velcro attachment doesn't stay as tight after unclipping. But the newer a3 is available with a ratchet for no extra cost, and when they still fit and hold my feet better than anything else. I had to return 2 of these before I finally got one that I could use! These are a horrible buy for $400 retail, but at $200 on bonktown.com, I made them work. The soles were drilled wrong on all 3, the first two had buckles that stripped very quickly (first 2-3 rides), and the one pair I kept now have a great deal of wear on them after just ~3 months. In addition, I contacted their customer service 4 times from different channels (direct email, web form, US national sales rep, headquarters via voicemail) and heard back from them only once via email, and the reply made it clear they didn't read my email, and referred me to the web form that they didn't answer either! I will keep them because I received them as a gift, but can't recommend these to anybody. If you're tempted to buy them, try to get them on bonktown.com for $165-$200 rather than retail at $400! The heat molding makes these work, as they are so stiff that if they're not molded to your feet, they are a torture device. Once they're molded, they can be stiffer than other non-molded shoes, but only slightly more so. In order to get them molded right, you have to tape any protrusions on your feet or punch out sections with a blunt object, and finding something to press on the heel cup/achilles area from the outside is also essential if the heel is going to hold firm. By comparison my Specialized S-works feel like a slipper, and are almost as stiff, with none of the crappy customer service or poor quality concerns. Had to place an order as my LBS didn't have my size. My 2 week wait turned into 2.5 months!! 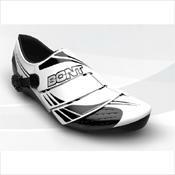 I specified that I wanted the NEW, as advertised on Bont's website 2011 A2 model, and I received the old 2010 model. When they arrived, they were delivered loose in a plastic bag! Small issue I know, but for a $400 pair of shoes, not even a box!! Come on Bont, lift your game. Pulled them out of the plastic bag to notice that the glued on microfibre around the heel was coming unbonded - and they are brand spanking new (would like to say out of the box, but can't for lack of a box!). To make matters worse, the size was different to the A1 model I tried on in store (3 times to be sure!) and was reassured that the mould for the A1 was the same as the A2's I was buying (note: Bont had a drastic sizing change a year or so ago). I love the fact that they state on their website "...through providing exceptional support and service..". They are living in fantasy land. Service, a quality finish and customer support are completely lacking at this company. To sum up.... Performance is second to none...super stiff, light as a feather and you feel like you are locked to the bike. However, for this amount of spend would expect better quality. Though shoes are mouldable, take note on how they fit when you are trying them on for size as moulding will only enhance foot feel and position, though will not add better padding for comfort. I have found that for short stint track rides...fantastic....though for distance rides is questionable for comfort due to lack of padding. This review is for the Bont A3, the fiberglass version of their cycling shoes without a buckle closure. I picked these up after reading about them online, getting sold on the semi-custom aspect, and feeling how light/stiff they were for the cost in person. They were great, until they started having issues. The walking pads came off in a matter of days. I rectified this with a cut up MTB dirtjumping tire epoxied to the shoe, much to Bont's (eventual, after a warranty) chagrin. Second, the cleat bolt t-nuts (you know, the things in the shoe your cleats bolt to) popped out after a cleat change. Unlike most shoes which use sliding nuts mounted in an enclosed layer in the sole, the Bont t-nuts simply use short-toothed grippers in the soft rubber sole to hold the nuts in place. This makes for a very fragile setup, and it seems like they can only take a couple cleat mountings before they come loose, never to be able to hold a cleat bolt tight again. In any case, my awesome shop warrantied them once. Bont took a month and a half to send them back, "repaired". No such luck. Immediately upon mounting my cleats the nuts popped out again. Brought them back to the shop, got a new pair of A3s they had (which were the same size as my old ones, yet fit smaller). I rode them twice, realized my cleat bolts were too long (you'll notice that because of the low sole stack height, you need to run shortened cleat bolts to keep from feeling them). Tried to switch out for shorter bolts, and the nuts popped out again. I said to hell with it, bought some cheap Northwaves, and the shop took the shoes back. Sorry Bont - your shoes are rad, when they work. I can't in my right mind give a good value or overall rating to a shoe that will have you SOL for most of the time. Specialized S-Works, Northwave whatevers, Sidi, etc. Another bad review for Bont's customer service. 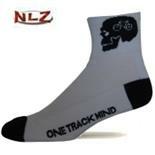 Ordered a pair of A-1 from my LBS, the owner of which does a great job on getting customers what they need. When he placed my order, the Bont rep asked if I wanted 3-hole or 4-hole speedplay drilling? I took the speedplay. 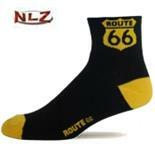 I also needed a narrow, which is an option with Bont (at least according to their website). I was told '6 weeks', which I thought was reasonable given the order. 4.5 months later? Nothing, and neither the bike shop owner nor the rep could get me an estimate on when the shoes might be done. "How about 3-hole drilling?". No response from Bont on that request either. I finally canceled the order, and sent Bont a curt email explaining my experience. I got a reply from Claire in their customer service dept asking for more details on the transaction, which I replied to. That was two weeks ago, and I haven't heard another peep. The most maddening part of this is that since I placed the order in March, I've seen numerous advertisements for several new models from Bont, and the shoes are starting to show up in the catalogs of large mail order houses.......they can build new models and color packages, yet can't fill an existing order. Not only can they not fill an order, but they can't even correspond with a customer and give an estimated arrival time. Not much of way to run a business which apparently prides itself on building 'custom shoes'. Other than pricing, nothing. Factoring I should get 3yrs of use, cost per year is only $165. Good looking, comfortable and power transfer sum up this shoe. Pedaling on the flats was similiar to other mfg's, yet pulling up on the rolling hills, I felt the shoes connected to my foot & no heel slippage! Attacking on hills was a revelation. My bike acted like it was like half the tour on HGH, as it went straight and fast. I truly believe I could see 3-5% better power transfer. You have to have some patience and get them molded to your feet before you say you dont like them. The best shoe available. May take a couple of moldings and heat gun in spots to dial it in due to the carbon basket and how high it comes up but once they are dialed in they can not be beat. I tried my old carbon soled shoes after about 4 months on my Bont A1's just to see if I noticed a difference....I determined I can never ride another shoe again. I could feel the pedal, the shoe flexing, like I was losing power. It’s been over 4½ months since I ordered and paid for (in full by the way) a pair of Bont A1 cycling shoes and I have yet to receive them. There have been numerous emails, phone conversations, heated debates, sizing complications, color misinterpretations, added shipping charges, and don’t let me forget about the entire month of February were everyone apparently stops working in order to celebrate the “Chinese New Year!” These are just some of the obstacles and excuses thrown my way by Bont Cycling; for example, for the past 2 weeks I have been told by Bont that my shoes are in the air and on their way, but stuck at customs. I know this is a new company and international expansion is a good thing, but if you can only make 30 shoes a day, then don’t take other people’s money for orders you can’t possibly fill. The bottom line is that Bont shoes are now made in a factory in China, even though at their debut at Innerbike in Las Vegas last year all you heard about was their Custom Cycling shoes that were handmade in Australia. After being promised by Bont that my shoes would arrive in less than three weeks time, I finally got a package after 2½ months. They were gorgeous, except for being the incorrect size, the wrong color, and they had a buckle (I wanted the three strap version-No Buckles)! Bont told me that they would NOT REORDER my initial specs until they physically received and processed their mistake, which cost me 2 more weeks of waiting. I was back to square one! I did at least slip them on just to get any idea of their fit and stiffness, buckled ‘em up, took one step on my carpeted floor and the heel support broke clean-off! And I only weigh 140 lbs! Oh yea, I had to pay for the return shipping never to be reimbursed. After “reconfirming” my initial order over the phone, I was then told that the three-strap option and color choice I selected 2½ months earlier would now bump my order from Stock to Semi-Custom status and an additional $80 would be required before they would proceed. Oh yea, and additional shipping charges were added on again. After feeling totally vulnerable and like things could not get any worse after being promised once again I would have my Custom shoes (or should I say “Semi-Custom shoes”) on my feet in less than 4 weeks time, I paid the added fee and waited. . . I waited. . . And, I waited. . . That was over 2 months ago, it is now late spring, and the race season has begun. I’m thinking about taking up fishing instead of cycling. Anyone who wants to purchase Bont Cycling shoes be very cautious, they do require that you pay-in-full and upfront and they will NOT RETURN, REFUND, OR CANCEL any Semi-Custom or Custom orders. I have asked, begged, demanded, and even threatened Bont in hopes of a refund, but was told “No, its a Custom-order!” Right now, I would only recommend buying the stock versions from a local shop that you can physically try on and walk out the door with them on your feet. I hope in the next year or so Bont can modify their return policies and any guarantees, service issues, expectations and fix all the international miscommunication between Bont itself, its distributors, and its retail shops which is crippling their name and their product, but until then please be cautious!